France's National Public Prosecutor's Office began examining the bid to award the tournaments, to Russia and Qatar respectively, last year. Le Monde reports that prosecutors are looking into allegations of corruption. The French newspaper also reports that Blatter was spoken to by investigators on Thursday, 20 April "as a witness". In March, Fifa passed on evidence to Swiss and United States authorities, whose own investigations into alleged corruption at football's governing body began two years ago. In May 2015, Swiss authorities raided a Zurich hotel and arrested seven people who were among 14 indicted on corruption charges in an inquiry led by the United States Department of Justice. In December that year, 16 more officials were charged following the arrest of two Fifa vice-presidents at the same hotel in Zurich. 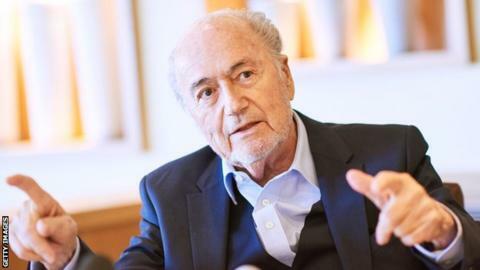 Blatter's 17-year reign as Fifa president came to an end as he was banned from all football-related activities for eight years - later reduced to six - in December 2015. The 81-year-old was found to have made a £1.3m "disloyal payment" to ex-Uefa boss Michel Platini, who was also banned for six years. That payment is also being looked into by Swiss prosecutors.